Summary Two bay RAID 1 class NAS with Gigabit Ethernet port. Powered by dual-core Intel Celeron CPU. Not all NAS buyers are looking for a four-bay RAID5 device. With disk capacities now reaching 10 TB, you can have a 10 TB fault-tolerant RAID1 NAS with a very small footprint and low power consumption by choosing a two-bay NAS. While RAID1 isn't as efficient in utilizing disk capacity as RAID5, two-bay NASes are also cheaper than their four bay siblings. It's been awhile since we've reviewed anything from ASUSTOR. In December 2015, we reviewed the ASUSTOR AS100XT family including the AS1002T. In March of 2016, we reviewed the ASUSTOR AS610XT family including the AS6102T two-bay NAS. 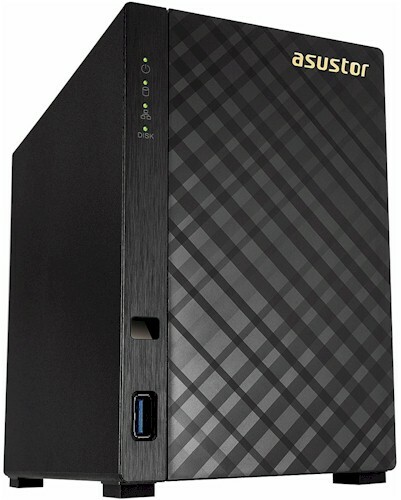 This review will feature the ASUSTOR AS3102T two-bay NAS - also a member of ASUSTOR's "Personal and Home" category, like the AS1002T. The AS3102T does not replace either of the other two NASes. But, interestingly, does share the same processor/memory configuration of the more expensive AS6102T, which is a member of the ASUSTOR "Home to Power User" category. For this review, I decided to compare the AS3102T with the AS6102T and QNAP TS-231P. The comparison between the AS3102T and the AS6102T will be interesting, because they share the same memory and processor configuration. The comparison with the QNAP TS-231P will be interesting, as it ranked well but is quite a bit less expensive than the AS3102T. Both the AS3102T and the AS6102T have 2 GB of memory but the AS6102 is upgradeable to 8 GB; the QNAP TS-231P only has 1 GB. All three NASes have three US 3.0 ports; In addition, the AS6102T has two USB 2.0 ports. The AS3102T does not support hot-swappable drives; the other two NASes do. Both of the ASUSTOR NASes have HDMI video ports; the QNAP TS-231P does not. The callouts and LED indicator key chart below shows the front panel for the AS3102T. The front panel also has a single USB 3.0 port in addition to the two USB 3.0 ports found on the rear panel. Note: ASUSTOR uses "family photos" to identify front and rear callouts for their AS310xT and AS320xT models. The four-bay models were used to also represent two-bay models. The rear panel has the power button, reset button, two USB 3.0 ports, HDMI port and single Gigabit Ethernet port. There's also a power jack for input from the external power supply and a K-Lock slot. As noted above, this image is a four-bay device. The layout is the same for the AS3102T, but the case is narrower and the fan is smaller. It's fairly easy to take off the cover of the AS3102T. In fact, you have to remove the cover to install the disk drives as outlined in the Quick Installation Guide. The photo below shows the main board tucked under the drive support frame. Drives slide directly into the frame and are secured by supplied thumbscrews. The table below shows the key component summary comparison for the ASUSTOR AS3102T, ASUSTOR AS6102T, and QNAP TS-231P. Component identification for the ASUSTOR AS3102T is courtesy of TechPowerUp's review, which also has many more interior and board photos. The AS3102T drew 14 W with two of our stock WD Red 1 TB (WD10EFRX) spun up and 7 W in power save mode with the drives spun down. Fan and drive noise was rated very low.